The Electricity Program prepares students for meaningful employment in the fields of electrical contracting, design, or engineering. Students learn in shop workstations and at o campus worksites training on modern electrical devices, apparatus, and wiring used in residential, commercial, and industrial settings, as well as advanced electrical theory and Electrical Code updates. 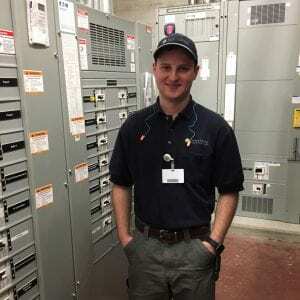 Students learn to install and troubleshoot live equipment, including motors, controls, transformers, advanced high and low voltage systems as well as blueprint reading, and metering. John A. Penney Co., Inc.
Peter Binda, Helco Electric, Inc.